BELLEVUE, Nebraska (CNN) -- If LeRoy Carhart's abortion clinic had a terror alert scale, it would be at Code Red this weekend. Anti-abortion protesters plan demonstrations this weekend outside Dr. LeRoy Carhart's clinic in Bellevue, Nebraska. "I feel safer on an airplane than I do in my clinic," Carhart said, sitting at his desk in his windowless office in Bellevue, Nebraska. "You try to think about every way an attack could happen. You try to do all you can to prevent it, but obviously Dr. [George] Tiller thought he was safe in church." It's been nearly three months since Tiller, one of the world's most well-known doctors performing abortions, was shot in the head at point-blank range on May 31 as services began at Reformation Lutheran Church in Wichita, Kansas. Anti-abortion groups, led by Operation Rescue, plan to launch protests outside Carhart's clinic this weekend in Bellevue, just south of Omaha. They will be the first major anti-abortion protests since the Tiller killing. The demonstrations are set to culminate Saturday with so-called Truth Trucks -- delivery trucks with giant rolling billboards of dismembered fetuses on the sides -- parking outside Carhart's clinic and canvassing area neighborhoods. Protesters carrying anti-abortion signs also are expected. Operation Rescue President Troy Newman has vowed a peaceful demonstration and said that any hints of possible violence are ginned up by what he calls left-wing groups and the liberal media. His group scaled down plans to protest at Carhart's facility Friday when it learned women's rights groups, including the National Organization for Women, would be there. Operation Rescue will hold a rally at a church instead Friday. "Operation Rescue has said Dr. Carhart is the next target ...," said Katherine Spillar, executive vice president with the Feminist Majority Foundation. "We fear that these kinds of activities can eventually erupt in violence, and I urge the community to make sure violence doesn't happen." Abortion rights supporters were predominant in the 50 to 75 people gathered outside the clinic Friday morning. "Welcome, welcome, this clinic stays open," some shouted when cars pulled into the clinic's driveway. Newman said earlier, "I'm not interested in putting our folks in any situation where the other side might flare up. I'm very confident about our side. They're very peaceful moms and dads and families that will be showing up with signs." He said he abhorred the killing of Tiller. "Shooting someone in the head in a church," he said, "is not a pro-life act. Sorry, it doesn't qualify." Scott Roeder, a 51-year-old anti-abortion activist, is charged in Tiller's killing. He has pleaded not guilty. Newman said he wants Carhart shut down -- through legal means. He said he was confident his organization would have shut down Tiller this summer through a legal battle. "I vehemently disagreed with what Mr. Tiller did, as well as all abortionists for what they do. But they're still human beings, and they deserve due process," Newman said. Tiller was one of about a dozen U.S. doctors who performed late-term abortions. In the wake of his death, his family decided to close his clinic permanently. Carhart was a close friend and understudy of Tiller's. He performed abortions at Tiller's clinic for a week every month, including late-term procedures. Carhart has vowed to open an office in Kansas and said he'll keep doing abortions as long as he's healthy. He said he's performed more than 60,000 abortions in the past two decades. About 400 of those were after 24 weeks, he said. Staring across the room at a poster of Tiller, he said, "I don't want his death to be in vain. He spent his whole life trying to ensure better health care for women." Carhart was performing an abortion in his clinic when Tiller was killed that Sunday morning. He learned of the news by phone from Tiller's head nurse. "That's when she told me that George had been shot in church and that he was dead." Carhart is unlike many abortion doctors. He's doesn't parse his words about his profession. 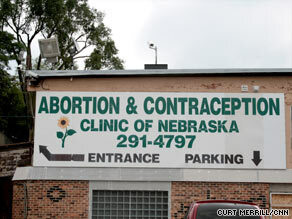 The outside of his office has the name of his clinic in bold letters: Abortion & Contraception Clinic of Nebraska. He said he takes pride in the term abortionist. "I do abortions, and that is what I do," he said. On Friday, Carhart teared up when talking about the abortion rights supporters outside his clinic. "It's unbelievable," he said of the support. Mark Gietzen, the driver of a truck for Operation Rescue, beamed with pride ahead of the protests. He stood outside his truck in Wichita adorned with a poster showing the dismembered hand of a fetus on a quarter. Across the top of the van, it reads, "Abortion is an ObamaNation.com." He said he knew Tiller "quite well" from the vantage point of a peaceful common enemy over the years and said the killing was a setback for "pro-lifers." He's only had one encounter with Carhart -- when the doctor drove his car by protesters and "quacked like a duck." Carhart acknowledges he might've done that. Gietzen's message to Carhart: "Please respect the life of the babies. Stop the killing, stop committing such a horrible act for money." Newman, the head of Operation Rescue, said he'll keep praying Carhart "turns back to the healing arts and not taking babies' lives." Carhart remains unmoved. "When they're ready to accept our position, then we'll sit down. We say choice is right. If you don't want to have an abortion, don't have one." Here in America's heartland, a battle is being waged and both sides are entrenched. There is no middle ground.